Protects Against High or Low Liquid Level. Magnetically Operated Switch-Leak Proof Body. Compact, rugged and reliable, the Model L4 Float Switch uses the time-tested Model V4 Flotect Switch body to provide dependable liquid level control to start or stop pumps, open or close valves - or actuate alarm signals. Features include: Simplicity of design and a leak proof switch body, machined from bar stock for pressures to 2000 PSIG, (140kg/cm2), it eliminates the possibility of process fluids entering the switch compartment. The threaded conduit enclosure cover permits easy inspection or replacement of electrical assembly without shutting down the system, or removing electrical conduit. Power must be disconnected. The unit fits directly into tank with a threadolet or flange for easy installation. All units are explosion-proof and listed with UL. and C.S.A. for Class I, Groups C and D, Class II, Groups E, F and G or are flame-proof to CENELEC/SAA EExd IIB T6. The L4 Float Switch maintains predetermined liquid levels in tanks through direct pump control. Also used to control sump levels, scrubber system liquid levels and automatic tank dump operations. Controls levels or provides alarms for hydro-pneumatic tanks, low pressure boilers and various waste water and sewage treatment processes. With a special L-shaped float arm, it can be mounted vertically in tank top for tank overflow or alarm. Service: Liquids compatible with wetted materials. Body: Brass or 316SS standard. Magnet Keeper: 430SS standard, 316SS or Nickel optional. Temperature Limits: 4 to 275°F (-20 to 135°C) standard. MT high temperature option 400°F (205°C), (MT option not UL, CSA, ATEX or SAA). 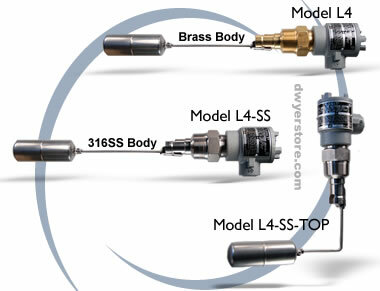 Pressure Limit: Brass body 1000 psig (69 bar), 316SS body 2000 psig (138 bar). Standard float rated 100 psig (6.9 bar). For other floats see options on "Options/Accessories" page. Enclosure Rating: Weatherproof and explosion-proof. Listed with UL and CSA for Class I, Groups C and D; Class II, Groups E, F, and G. ATEX 0344 II 2 G EEx d IIB T6 -20°C≤Tamb≤75°C, EC-Type Certificate No: KEMA 03 ATEX 2383. SAA: Exd II C T6 (T amb=60°C). IP66 C1 I, Zone I. Also FM approved. Switch Type: SPDT snap switch standard, DPDT snap switch optional. Electrical Rating: UL, FM, ATEX and SAA models: 10A @ 125/250 VAC. CSA models: 5A @ 125/250 VAC; 5A res., 3A ind. @ 30 VDC. MV option: 1A @ 125 VAC; 1A res., .5A ind. @ 30 VDC. MT option: 5A @ 125/250 VAC. (MT and MV options not UL, CSA, FM, ATEX or SAA.). Electrical Connection: UL and CSA models: 16 AWG, 6" (152 mm) long. ATEX and SAA units: terminal block. Process Connection: 1-1/2" male NPT standard, 2-1/2" male NPT required for optional floats. Mounting Orientation: Horizontal installation standard, optional vertical top mount. Weight: 4 lb 9 oz (2.07 kg). Dead Band: 3/4" (19 mm) for standard float. Specific Gravity: 0.7 minimum with standard float. For other floats see options on "Options/Accessories" page. Agency Approvals: UL, CSA, FM, CE and ATEX. -MV: Gold Plated Contact option for dry circuits. (See electrical rating on "Specifications" page, no listings or approvals). -MT: High Temperature option rated 400°F (204°C). (See electrical rating on "Specifications" page, no listings or approvals). -316: 316SS Magnet Keeper option to replace standard 430SS. -TOP: Top Mounted option for vertical flange installation (distance from flange face to centerline of float to be specified, 20" [508 mm] maximum). -50: 304SS rated 50 psig and 0.5 minimum specific gravity. -150: 316SS rated 150 psig and 0.7 minimum specific gravity. -300: 304SS rated 300 psig and 0.7 minimum specific gravity. -50 304SS Float rated 50 psig (3.5 bar) and 0.5 min. s.g. (2-1/2" spherical). -150 316SS Float rated 150 psig (10.3 bar) and 0.7 min. s.g. (2-1/2" spherical). -300 304SS Float rated 300 psig (20.7 bar) and 0.7 min. s.g. (2-1/2" spherical).